Hypothesis: using fluroscopy as a routine in performing gastric banding controls will enable early detection of possible complications and will optimize the adjustment of the band. Method: 100 patients were strictly followed up in our center for LGB control. All controls were done routinely in the x-ray department under fluroscopy. The plan of controls was 1st day, 6 weeks, monthly postoperative until the optimal adjustment of the band, than as necessary. Gastrographin was used in the first control and barium in the following controls. In standing position, patients were given contrast to swallow under fluroscopy. The position and angle of band, time of passage through the band, the width of passage and the formation of pouch in addition to the type of oesophageal peristalsis and oesophagial diameters were recorded. Adjustment of band was done accordingly and another contrast swallow was confirming the good adjustment or a readjustment was necessary. the patient weight, eating habits and presence of any symptoms related to the band were documented. The number of controls needed for each patient and the pathology detected at what period in the postoperative time were also registered. Results: 15 cases of asymptomatic patients with severe oesophageal dilatation, tertiary persitalsis and very slow emptying of the contrast were detected. in 10 cases, the oesophageal dilatation could be reversed and the function of the band could be restored with emptying of the band, medications and successive adjustments of the band, 4 patients the dilatation was recurred by adjustemt of the band and this combined with insufficient weight loss. Band was removed and a simulatneous gastric bypass was done. By 1 patients, incomplete ersosion was diagnosed and the band was removed. could be withmany cases of band slippage were detected on time before. 2 cases of disconnection of the port, 2 cases of torsion of the port, 1 case of baloon rupture with escape of contrast were detected in asymptomatic patients. 2 cases of slippage and 1 case of ersoion were detected in symptomatic patients. Conclusion: in 10% of cases the fuction of the band could be restored and unreversible oesophageal dilatation which could lead to future slippage were corrected. 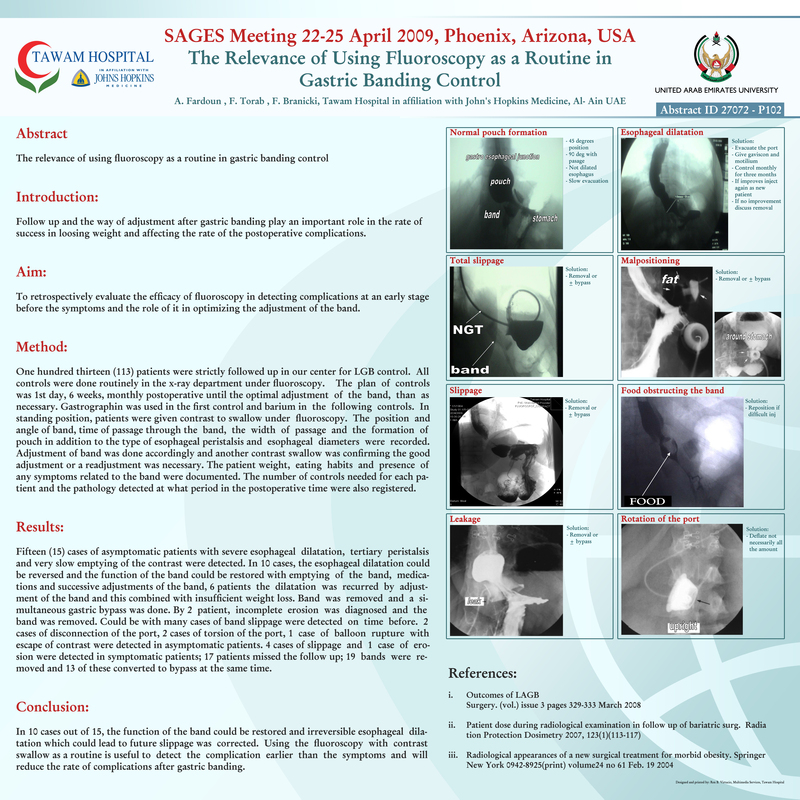 Using the fluroscopy with contrast swallow as a routine is useful to detect the complication earlier than the symptoms and will reduce the rate of complications after gastric banding.